Summary: Quin Kincaid has been put through years of brutal training for what she thinks is the noble purpose of becoming a revered ‘Seeker’. This is book is not really what I was expecting, and unfortunately, that is not a good thing in this case. I skimmed a good chunk of this book, mostly in the middle. I will say that the last third was pretty interesting and I wish that that had been spread out through the whole story. First of all, I have to say that the beginning of the book feels like we're being thrown into the middle of the story. Now, sometimes that does work, this is certainly not to say that being flung headlong into action is not at all a way for a book to ever start. It can work and I have read books that approach it the right way. This is not one of those books. Unfortunately, this was the start of a trend, which was that for a good chunk of the book I felt as though we didn't know what the hell was going on, and the world building and plot weren't necessarily compelling enough to make up for that fact. The book is structured in a way that we go from point of view to point of view, written in the third person. Now, I'm not a particularly big fan of this type of writing - in GoT, for example, I ended up quite often just reading one character's story all the way through because that happened to be the one I cared the most about. I know it's common in fantasy, especially high fantasy, but it has to be very compelling to work. This book doesn't quite get that across, instead the jumps are rather disjointed and it didn't lend itself to the flow of the book at all. A lot of this would be something that I could deal with if the world building was compelling enough, but unfortunately I found this lacking as well. This is mostly towards the beginning of the book, but this is crucial, and were it not for the fact that I got this as an ARC through Netgalley, I might not have finished it at all. I have a feeling some readers out there will find it too much of a slog and the early reviews seem to back that up. Basically, there are too many questions and not enough answers, or more importantly, not enough depth to make the reader curious enough to keep on going. I had so many questions. Where is this set? When is this set? What's the explanation behind the technology and the culture? 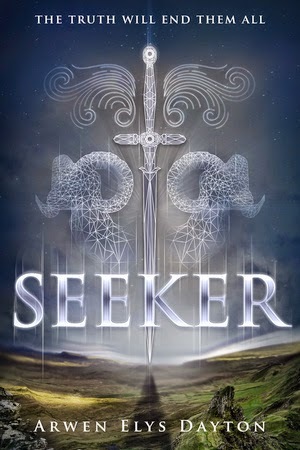 What's the background behind Quin's family, besides the fact that she's a 'Seeker'? Where did they come from? Why? The answers to a lot of these do come, but they come very late in the book and that left me stewing in frustration for much of the read. Now, even all of this would be forgivable by me if the characters were fascinating and made me care, but they didn't quite hit the mark here, either. I mean, I guess I cared about Quin, but not overly so, because she wasn't strong enough against the backdrop of the confusing background, the lack of world building, and the plot that wasn't quite clearly laid out enough for me. So all of this ended up with the book being a rather 'meh' experience for me, which was why I am giving it two stars. Disclosure: I received a copy of this book for free through Netgalley in exchange for an honest review. Physical vs Ebooks... A nice dilemma to have!